In the beginning there was ASCII code, which supported the English alphabet. Standard ASCII characters consist of 7 bits, which are not enough to support other languages. Because a byte usually consists of 8 bits, ASCII characters can be extended to characters of the ISO-8859 family. This is not very convenient if you want to send it over the web, and the reader needs to know what type of encoding is used. In addition, an ISO-8859 standard limits the text to 256 chars, and there are standards that support more characters and more special symbols. Unicode supports multi-byte characters, but still is an extension of ASCII, which means that text originally in ASCII remain the same in Unicode. How? By using the fact that ASCII characters are 7-bit long. So, if the characters leftmost bit is 0, it is an ASCII character. 10xxxxxx Trailing byte. The rest of the multi-byte character bytes are of this form. According to the value, find the range. Place the bits of the value in the available bits of each byte. In the table you can see that its in the range 0800h-FFFFh. Thus, it is a 3-byte characters. Information about each Unicode characters can be found in the file ‘UnicodeData.txt’. 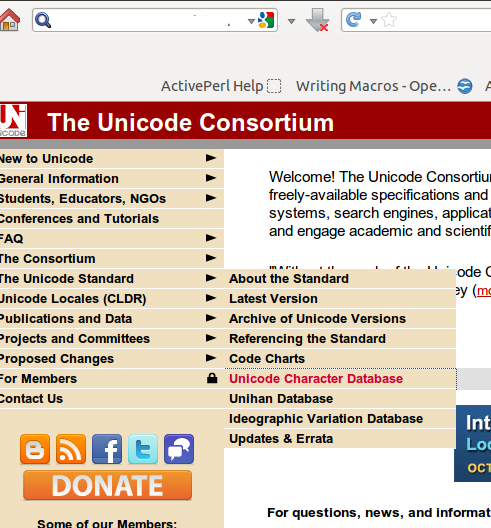 To download it browse the Unicode Consortium site. 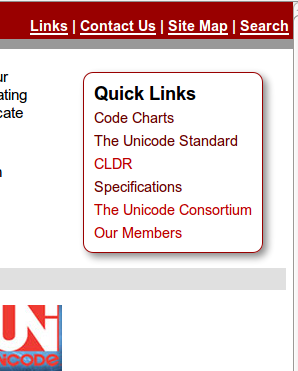 “Side menu -> The Unicode Standard -> Unicode Character Database” will get you in a page where you can find a link to the latest version of the unicode character data. The file ‘UnicodeData.txt’ and others, will be found here. This file is a reference database of character information. Each character has a line in the database, and the fields are separated by semicolons. The bidirectional file is the fifth field in the row. It can be the character direction (Left to right, Right to left), a white-space, a non-spacing mark (a mark that is displayed without changing the position, such as Hebrew points, Arabic vowel signs, accents above vowels, etc.). From the ‘Quick Links’ frame, choose specifications. From the Specification page, choose Unicode Character Database, under ‘General’. Table 9, contains the description of each fields. The field number (after which semicolon?) is in parentheses in column 4 of the table. In the Specifications page – mentioned in the previous section -, under “Rendering”, you can find a link to the algorithm converting input bidirectional text into visual, i.e. how the text should be displayed if we just typed it left-to-right. FriBiDi is an implementation of the algorithm in PHP.